We made this cake for my grandfather’s 97th birthday. I’m not going to write down the recipe for it, because you really should just go buy Dorie Greenspan’s book Baking: From My Home to Yours , and make it out of that (it’s the one on the cover, with cake crumbs patted all over the outside). I do recommend our one embellishment, which was to stuff the frosting layers with fresh raspberries, and have lots of additional raspberries available to scatter over the top. 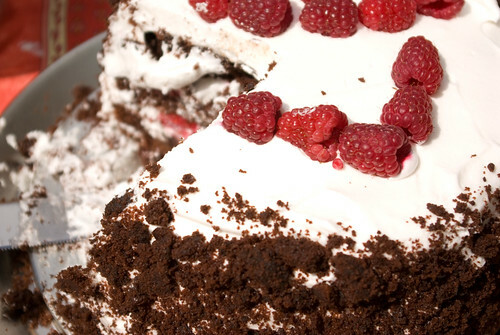 Raspberries + chocolate cake + marshmallow creme frosting. Oh, yes. 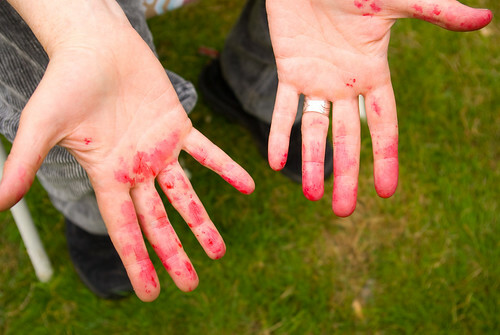 It was a bit of a messy dessert, as the marshmallow frosting got soft and melty in the sun, and the raspberries were so ripe they turned people’s hands crimson. But it’s not like that was a real problem.